I am going through a sewing lull. I’ve been putting only a few minutes a day into this bodice- but last night I got about an hour of sewing time, so I actually have some photos to share. My serger has been broken for a while, and until I can get it repaired I’ve had to look at alternate ways of seam finishing. I decided the neatest way would probably be to use seam binding, so all the inside seams were bound this way after I did my seams. When it came time to think of boning I was stuck again. I have a confession: I usually use plastic boning. I have a big ol’ spool of the stuff that never seems to diminish in quantity, no matter how many dresses I’ve made. For this project, though, since I got this far without the aid of a serger, I thought I might try to use some of my steel bones I bought a few years ago. I could not decide what sort of casing to use. I’m trying to make this gown from just items in the stash and I Didn’t want to order casing just for the inside. 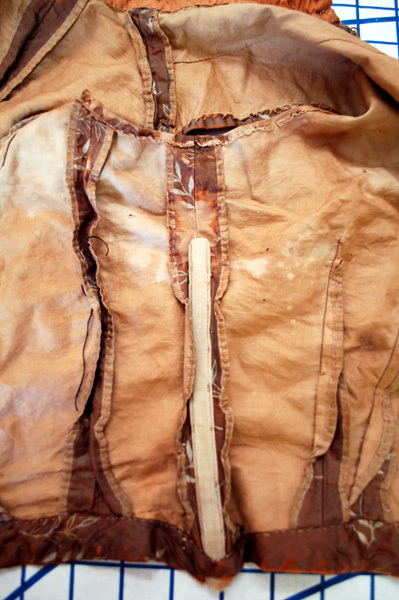 I decided to pull out one of the “distressed” bodices I’ve got in my collection and have a peek inside. 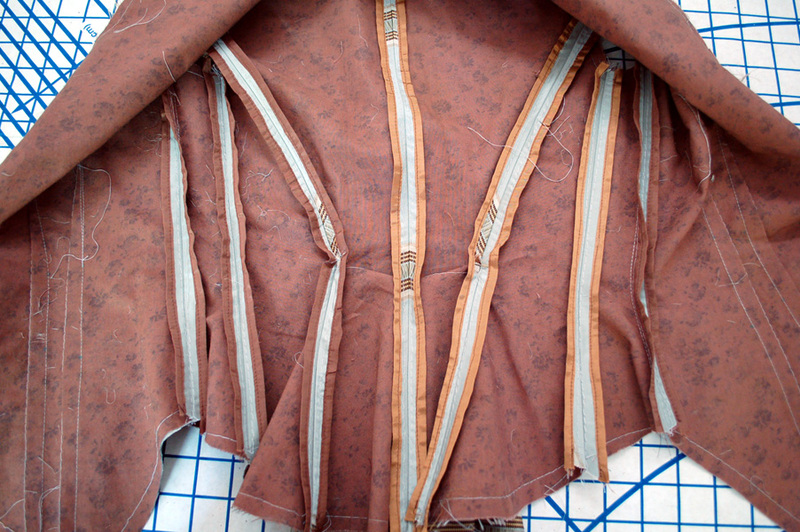 My confidence level just jumped incredibly when I saw the rows of hand done seam binding and the seam binding type material covering the inside bones of this bodice! 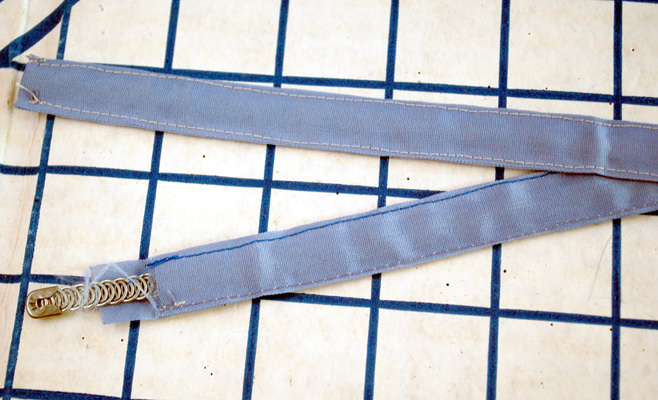 Although heaven knows I didn’t do them by hand, and I don’t have 1/2″ straight steel bones on hand, I thought I’d adapt the seam binding method to use with my 1/4″ spiral steel bones. I could always replace them later with 1/2″ straight bones, but this will do the trick for now. I also have made a note to self regarding the inside seam shaping. 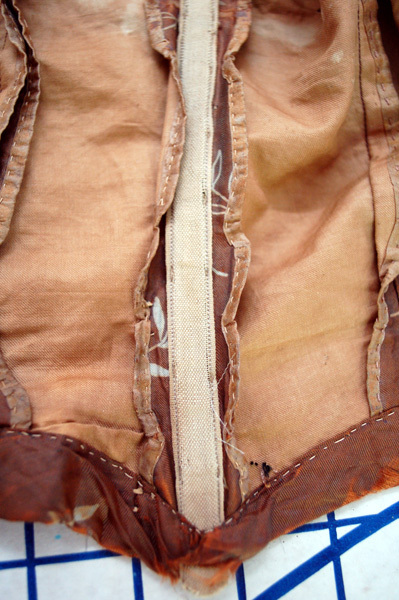 Notice how the seams scallop in at the areas close to the waist or where there are curves- just like how we not clip curves for construction, but this method will keep the seams all tidy inside while still letting the outside lay flat. I also noticed that the darts had been split- similar to what you do in professionally tailored jackets- and then each part of the raw edge was bound. So here’s a few of the little bones in their seam binding casings. Gotta just finish up those, then I can add them, check the bodice fit again, and move on to the next step!